There are two basic types of foam, chemical and mechanical. Chemical foam is formed by mixing together a solution of an alkali (usually sodium bicarbonate), an acid (usually aluminum sulfate), water and a stabilizer. The stabilizer is added to make the foam tenacious and long-lived. When these chemicals react, they form a foam or froth of bubbles filled with carbon dioxide gas. The carbon dioxide in the bubbles has little or no extinguishing value. Its only purpose is to inflate the bubbles. From 7 to 16 volumes of foam are produced for each volume of water. Premixed foam powders may also be stored in cans and introduced into the water during fire-fighting operations. For this, a device called a foam hopper is used. Or, the two chemicals may be premixed with water to form an aluminum sulfate solution and a sodium bicarbonate solution. The solutions are then stored in separate tanks until the foam is needed. At that time, the solutions are mixed to form the foam. Few chemical foam systems are still in use aboard vessels. Mechanical foam is produced by mixing a foam concentrate with water to produce a foam solution. The bubbles are formed by the turbulent mixing of air and the foam solution. As the name air foam implies that the bubbles are filled with air. Aside from the workmanship and efficiency of the equipment, the degree of mixing determines the quality of the foam. The design of the equipment determines the quantity of foam produced. There are several types of mechanical foams, similar in nature, but each has its own special fire-fighting capabilities. Protein foams were the first types of mechanical foam to be marketed extensively and These foams are usually produced by the hydrolysis of waste protein material, such as protein-rich animal waste (i.e., hoofs and horns) and vegetable waste that is hydrolyzed (subjected to a chemical reaction with water that produces a weak acid). In addition, stabilizing additives and inhibitors, such as mineral salts, are added to prevent corrosion, resist bacterial decomposition, to control viscosity and increase their resistance to withering from the heat of a fire. At the time of a fire, the protein foam concentrates are mixed with fresh or seawater in 3% or 6% solutions. The foam concentrate can produce foam with all types of water, except water that is contaminated with oil. When antifreeze is added, foam can be produced in subfreezing temperatures down to -23.3°C (-10°F). Fluoroprotein foams are formed by the addition of special fluorochemical surfactants with protein foam (fluorinated compound bonded to the protein). This enhances the properties of protein foam by increasing foam fluidity (ease to flow) and improves the properties of regular protein foam by providing faster knockdown and excellent fuel tolerance. Fluoroprotein foam works well with dry chemical agents, and when the water is mixed with antifreeze, it produces foam in sub-freezing temperatures. (c) Film Forming Fluoroprotein Foam (FFFP). FFFPs are a combination of fluorochemical surfactants with protein foam. They are designed to combine the burnback resistance of a fluoroprotein foam with an increased knockdown power. These foams also release a film on thesurface of the hydrocarbon. (d) Aqueous Film Forming Foam (AFFF). AFFFs are a combination of fluorochemical surfactants and synthetic foaming agents that create a unique characteristic – an aqueous film. This film is a thin layer of foam solution with unique surface energy characteristics that spreads rapidly across the surface of a hydrocarbon fuel causing dramatic fire knockdown. The aqueous film is produced by the action of the fluorochemical surfactant reducing the surface tension of the foam solution to a point where the solution can actually be supported on the surface of the hydrocarbon. AFFFs are more effective on hydrocarbons (fuels) with higher surface tensions, such as kerosene, diesel oil and jet fuels, and less effective on fuels with lower surface tensions, such as hexane and high octane gasolines. 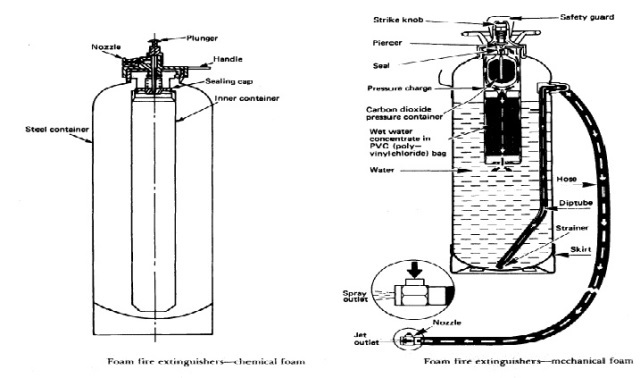 AFFF’s may drain foam solution (the water and foam concentrate mixture) rapidly from the foam bubble to produce optimum film formation for rapid fire extinguishment. To achieve these qualities, long term sealability and burnback resistance are sacrificed. Synthetic detergent-base foam is made up of alkyl sulfonates. This form has less burnback resistance than protein formulas, but may be used with all dry chemicals. It foams more readily than the proteins and requires less water. This is important where the water supply is limited. What is requirements for fire pump on ship as per SOLAS ? What is Mechanical (Air) Foam ? What are Class of bulkhead as per SOLAS ?